The Dragon's Tales: Did the Early Earth Have Multiple "North & South" Magnetic Poles? Did the Early Earth Have Multiple "North & South" Magnetic Poles? 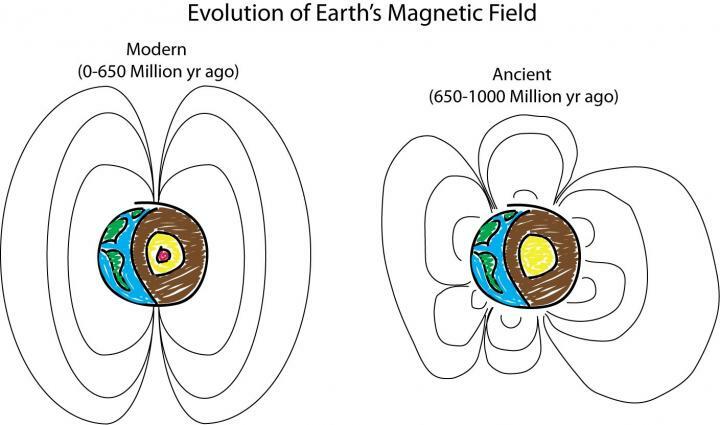 New work from Carnegie's Peter Driscoll suggests Earth's ancient magnetic field was significantly different than the present day field, originating from several poles rather than the familiar two. It is published in Geophysical Research Letters. Earth generates a strong magnetic field extending from the core out into space that shields the atmosphere and deflects harmful high-energy particles from the Sun and the cosmos. Without it, our planet would be bombarded by cosmic radiation, and life on Earth's surface might not exist. The motion of liquid iron in Earth's outer core drives a phenomenon called the geodynamo, which creates Earth's magnetic field. This motion is driven by the loss of heat from the core and the solidification of the inner core. But the planet's inner core was not always solid. What effect did the initial solidification of the inner core have on the magnetic field? Figuring out when it happened and how the field responded has created a particularly vexing and elusive problem for those trying to understand our planet's geologic evolution, a problem that Driscoll set out to resolve. Here's the issue: Scientists are able to reconstruct the planet's magnetic record through analysis of ancient rocks that still bear a signature of the magnetic polarity of the era in which they were formed. This record suggests that the field has been active and dipolar--having two poles--through much of our planet's history. 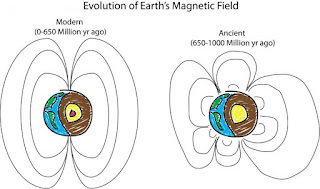 The geological record also doesn't show much evidence for major changes in the intensity of the ancient magnetic field over the past 4 billion years. A critical exception is in the Neoproterozoic Era, 0.5 to 1 billion years ago, where gaps in the intensity record and anomalous directions exist. Could this exception be explained by a major event like the solidification of the planet's inner core?